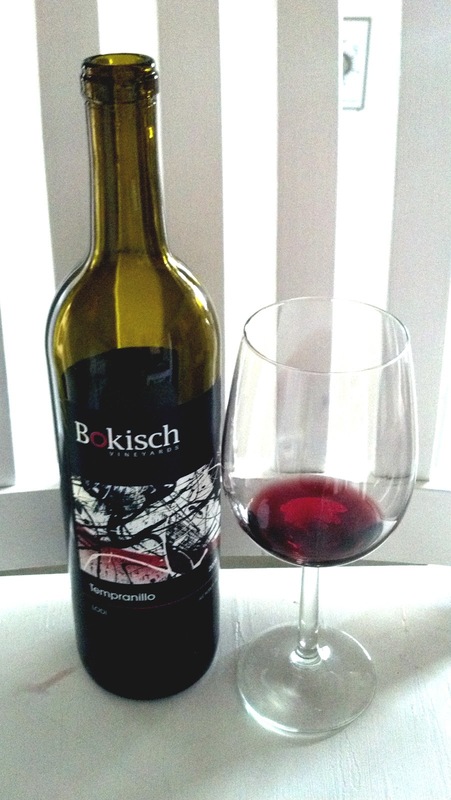 Time to uncork another wine of the week; in the spot-light this week is Bokisch Vineyards Tempranillo, a wonderfully expressive Spanish grape, known as the Cabernet Sauvignon of Spain. I was surprised to find this one was grown and produced in Lodi, Ca. but was pleasantly surprised by the quality of this wine. Especially considering this wine had been not only gassed once but a second time with Argon food-grade gas to preserve it quality from oxidation. A beautiful garnet candy colored core dances in the glass, on the palate a smorgasbord of flavors and aromas; rustic strawberry, Bing-cherry, baking spices and a splash of freshly wrapped cigar tobacco. A great foodie type wine, showing off a nice vein of acidity and a smooth tannins. This wine sells for a suggested retail price of $21, but you can still get this wine from the "Vault" for under $20, a great price for a really well made bottle of wine. The recommended pairing Canapes of Boquerones; which is much easier to make than it sounds. I had the chance to give this wine a swirl while I was at one of San Diego's best wine-n-dine locations; the Wine Vault and Bistro and easily found as it located right off the I-5 Washington Street exit and a quick left up to India Street. If you have not had the opportunity to dine here, boy are you missing out. I'm always impressed the depth of their menu, the great wine-makers walking through their doors, fantastic service and how many times the proposed pairing works out rather fabulously. By the way if you want to have the best Martini that I've ever tasted and according to Chris the best Martini ever made, then you need to ask for one the next time you stop in. He calls it the Voyager Two-ooh-Nine. A $15 dollar Martini, well worth the price of admission. Until next time sip long and prosper, cheers!